Do you SUP with your dog? Tell us how Fido rides the rails. They’re our best friends. So why wouldn’t we want our pups to enjoy everything we do? 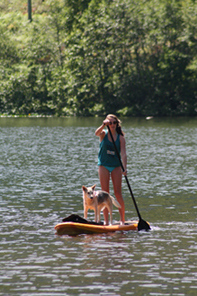 Enter paddle boarding with your dog! If Muffin loves to feel the wind in her fur, Sparky is happiest when the surf is high, or Rory loves a calm lake on a sunny day, we want to know about it. You SUP with your dog, and you both love the experience. These are your true stories, and they’re bound to make faces smile and tails wag. Join us by creating your own page where you can jump in with both paws to describe the best moments of human-canine-SUP companionship. Here you can tell your tale (or even your tail), add photos and video, and come back to add new adventures whenever you want. It’s where you can join the community of dog-loving SUPers and find out how others are enjoying their best friend and their best sport at the same time. Paddle boarding with your dog? Or shall we say pup-SUPing? It’s all paws-it-ive. Check out our new sister site www.supseniorenthusiasts.com. It is sure to inspire, entertain and motivate. Join the forums and find out about other SUP senior enthusiasts. The longest Stand Up Paddleboard (SUP) ride on a river bore is 1,690.5 metres (1,05 miles) and was achieved by Ivan Moreira and Bono the surfing dog from Brazil at Mearim River, in Arari, Maranhão, Brazil. 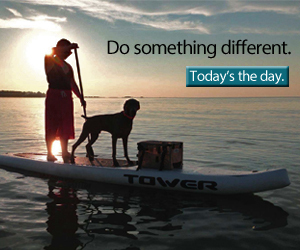 Did you just experience another grand day of SUPing with your awe-inspiring pooch? We want to hear about it – SUPing techniques, unique abilities, sharable SUPing secrets and rib-tickling moments. We want to make this section a hub for you to show-case, share and exchange your SUP water-dog moments. • Does your pooch make extraordinary moves on a SUP? • What was your dog's "a ha" moment learning to SUP? • Share your most clever tips for SUPing with your pup. • Post magical moments via photos and video. • Share your most hilarious SUP water-dog stories. • How did you get your anxious pooch to try SUPing? • Share a priceless moment. Enter your SUPer SUP title. Just start typing. Your writing will show up here. NOTE: It is suggested that you write your information in a computer program first, then copy and paste it hear. This is common back-up practise and keeps your precious words safe. That way you won't feel rushed to finish. Please keep your photo/s web safe small at 200kb or less. If you are submitting video, first open an account with YouTube or Vimeo, upload your video to your account. Copy the embedding code they provide, then paste it hear along with your writing. TIP: Since most people scan Web pages, include your best, most compelling or interesting thoughts in your first paragraph and main title. Do you have some pictures or graphics to add? Great! Note: The maximum image size accepted is 800x600. You can use a web-based resizer, such as Picmonkey. Click the button and find the first one on your computer. Select it and click on the button to choose it. Then click on the link if you want to upload up to 3 more images. For even more appeal, include a descriptor for each photo. Find the whole article on paddling with partners, sup with dogs in the Dog Fancy magazine, June 2014 issue. Thinking about stand up paddle boarding with your dog? Need a little inspiration to get started? We’ll post the best of the best canine SUP videos from public sources here to entertain, inspire, impress and put a smile on your face. Don’t be intimidated by some of these athletic pooches! A little practice, and you and your pup could be stars—or at least have a whole lot of fun trying. There are limits, of course. You're not going to take your Great Dane on a 9-foot board unless you’re shooting for a spot in Ripley’s Believe It or Not. And you won't take a non-swimming dog out without a doggy life jacket. 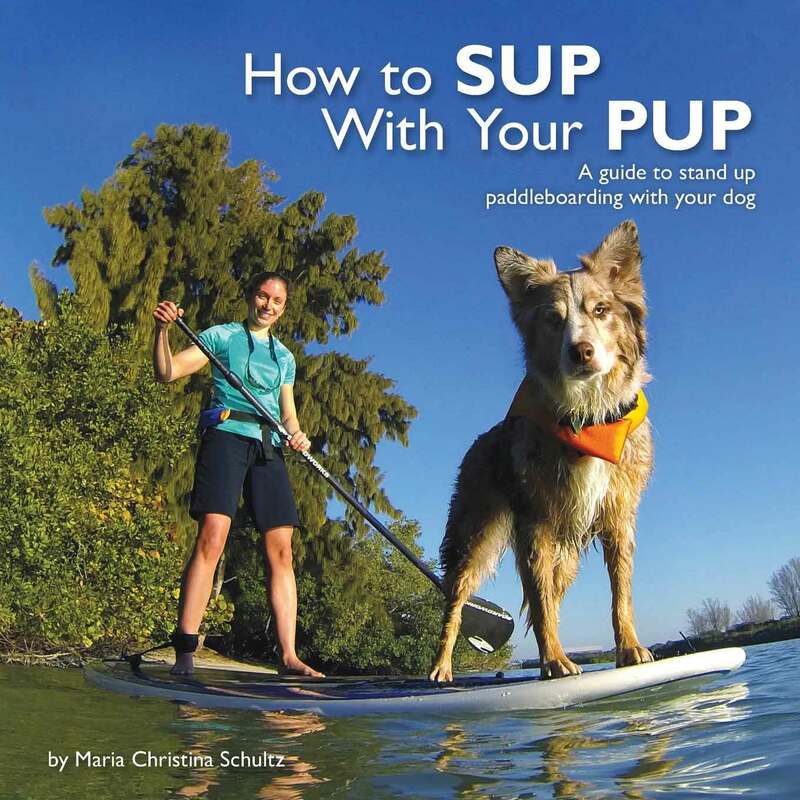 Check out the book How to SUP with your PUP (see link in left column) for preparation and planning guidelines. It might just be the nudge you need to ride the rails with Rex. If you think accessory manufacturers haven’t noticed how much you love to SUP with your dog, think again. Confident dogs often like to sit or walk to the nose of the board; precisely where most boards are lacking protection and grip. Now, there is a doggy pad for SUPs called "Tahoe Buddy Pad" designed for Tahoe boards (may be adaptable to other brand boards as well). There’s also the "Pup Deck SUP traction pad", another way to keep your best friend afloat. For your first time out together, consider renting a board to save your unprotected non-grip board. Most rental boards are sturdy and meant to take a beating. Call ahead to ask; you may be pleasantly surprised. Use a wider stance (unless you are surfing). This will give you more stability if your pup isn’t inclined to stay still. Kneeling when your pooch gets on and off offers better balance with the shifting of weight. If your dog loves the water and happens to be a super swimmer, then all you need is practice! NOTE: The last video on this page offers informative tips on the best ways to SUP with your dog and have fun. Natural Balance Dog invites you to the "Dog House"
I told him “you had me at woof!" This is Lani and master of Lani – the new generation water dog – wow! Maltese Terrier and $6000.00 SUP missing. Here's another smiler – Yolo dog surfing for the first time. If you are a dog and your owner every day suggests that you get him his slippers suggest that he buy you a SUP with a nice traction pad. I was told that SUP training with my dog could be difficult. It wasn’t, mine had me trained in two days. Wow, what great exercise and and great fun. Taking my SUP away from my pup would be worse than not having one. This is "SUP" the dog loving every every second of living the surf! and let your dog stand up. He's got the sway! Who's teaching who how to surf? My SUPing pit bull has me wrapped around his little leash. This little one's name is "Zoey" who doesn't need any lessons on how to move on aboard. This is in Comox Lake, Vancouver Island B.C. There is no psychiatrist in the world like Fido licking your face then petting your SUP, licking your face then petting your SUP. Okay...now this would be a challenge by most people's standards. This is Gunnar "the great" dane showing off his first time on waves in St. Augustine, Florida, U.S.A.
the more I like dogs. One reason a dog can be such a comfort when you're feeling blue is that he doesn't try to find out why. So when your dog asks you to go flat water paddling, just do it. Playful paddle enthusiast "Buster" absolutely loves water. He reveals his fearless sole here. BUSTER The Dog - Stand Up Paddle from Inmovimento Filmes on Vimeo. Money will buy a pretty good dog, but it won't buy the wag of his tail. You need a SUP for that. 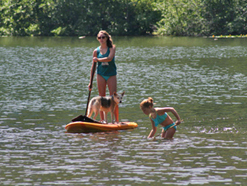 Tips to begin paddling with your dog. Some great tips to get master and pooch started. "How to SUP with your PUP"
So cal Surf Dogs located in San Diego, California. This is a club for surfing dogs and their owners. Check in to see upcoming events, info on safety, teaching your dog to surf and surf dog profiles. Paddle boarding at Summit Lake Provincial Campground in the southern interior of B.C. Canada. Fly fishing, SUPing, cycling and more.